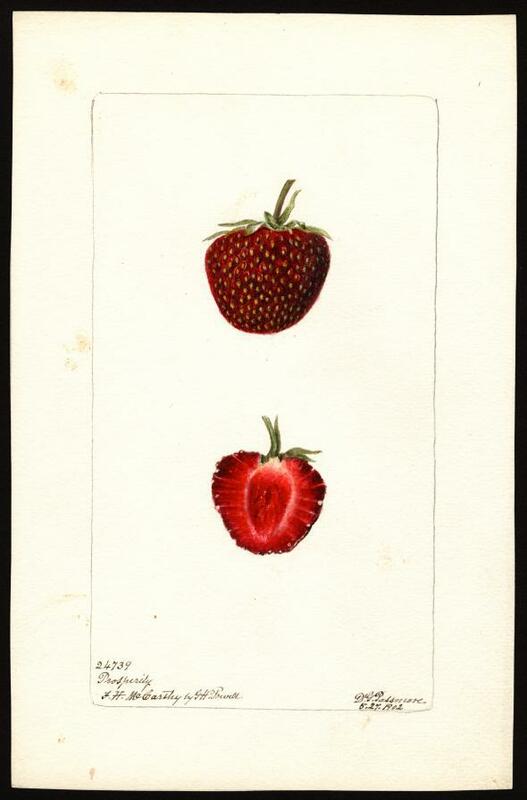 USDA art illustrating strawberry varieties from the early 20th century. California. Art by William Henry Prestele. 1892. 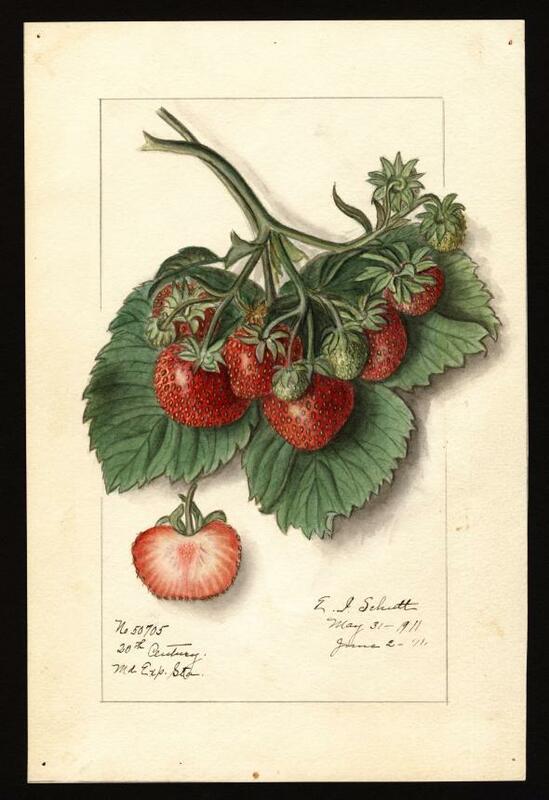 Here are some of the images found in a search for “strawberry” in the U.S. Department of Agriculture’s Pomological Watercolor Collection, which holds art made for the department between 1886 and 1942. 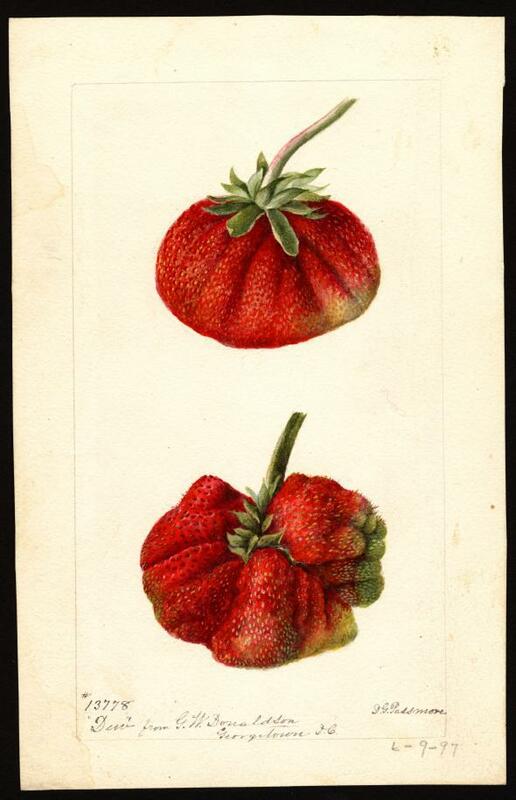 This collection contains USDA-produced art that was used in publications illustrating advances in pomology (fruit breeding and production) for the benefit of American growers. 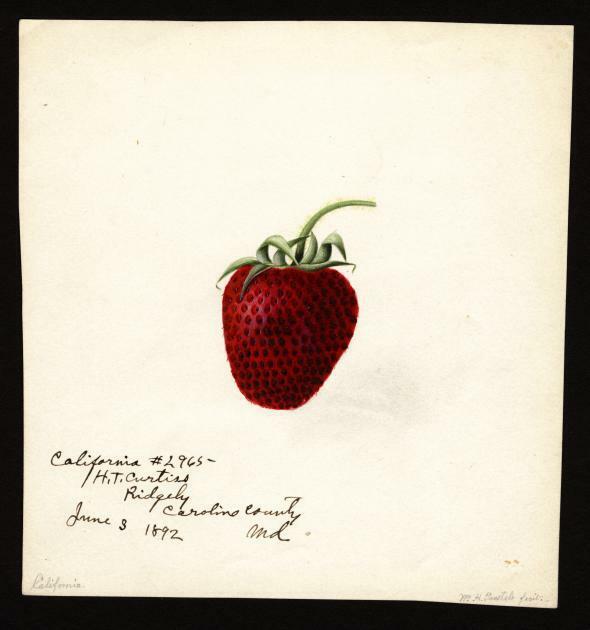 These images capture the varieties of smaller, darker berries commercially produced before the standardization of the supermarket distribution chain called for larger, tougher varieties that could stand a trip across the country. 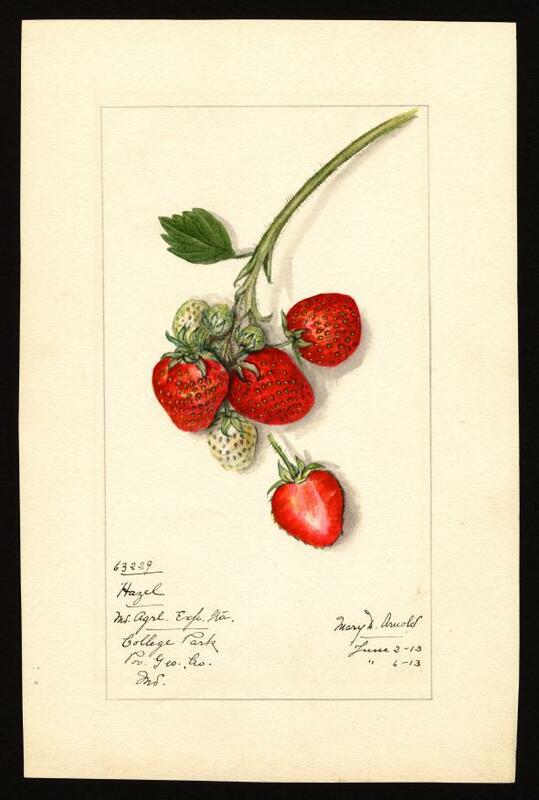 But these berries are by no means untouched by human tinkering. 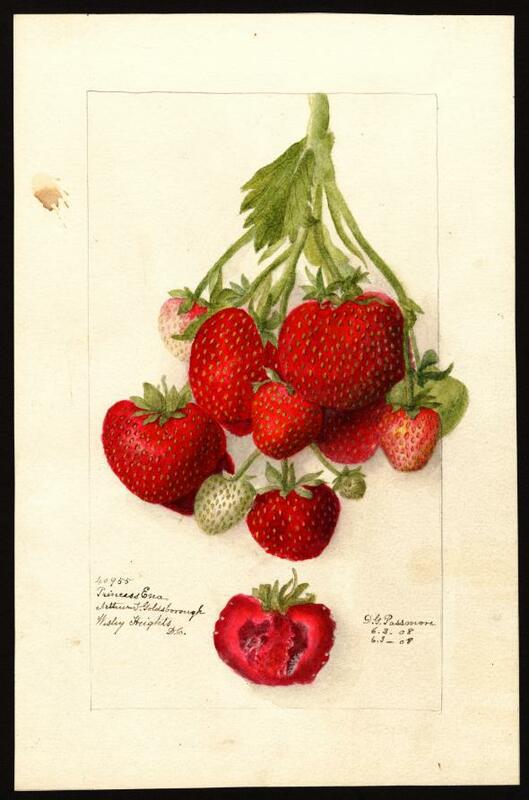 By the early 20th century, the University of Vermont’s Vern Grubinger writes, strawberries had undergone several revolutions in breeding; 19th-century American growers created a productive variety that “changed the strawberry into a major crop grown all across the continent.” But these cultivars still retain something of the diminutive, sweet quality of their forebears. 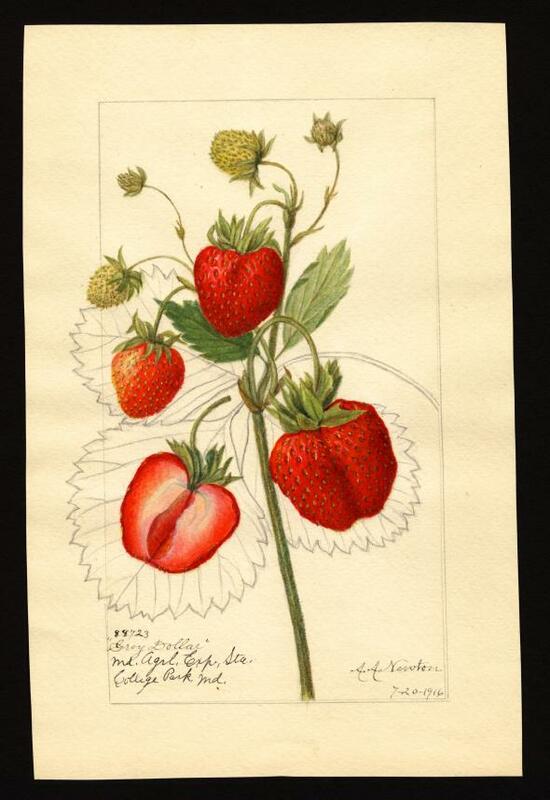 Botanical illustration has historically been a relatively socially acceptable way for women to participate in science. 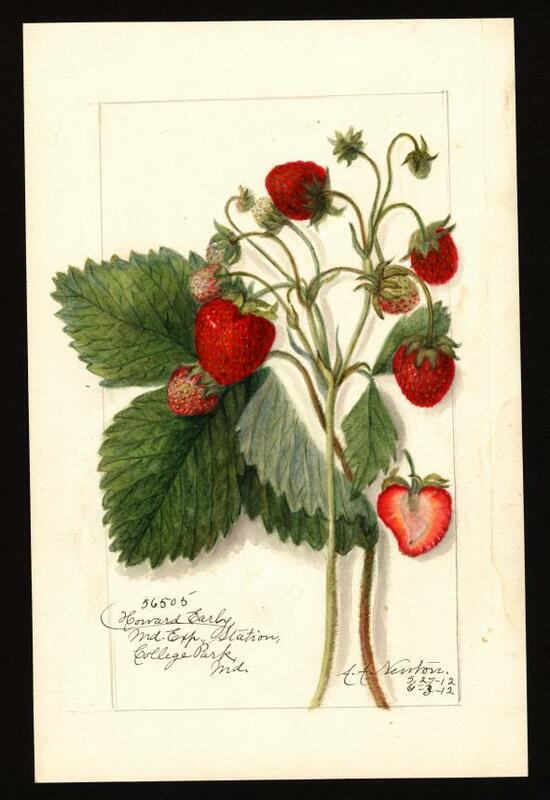 A good portion of the artists who worked for the USDA to produce these accurate illustrations in the age before reliably reproducible color photography were women. Their names appear in the captions below. 20th Century. Art by Ellen Isham Schutt. 1911. Dew. Art by Deborah Griscom Passmore. 1897. Hazel. Art by Mary Daisy Arnold. 1913. Howard Early. Art by Amanda Almira Newton. 1912. Grey Dollar. Art by Amanda Almira Newton. 1916. Princess Ena. Art by Deborah Griscom Passmore. 1908. Prosperity. Art by Deborah Griscom Passmore. 1902.